Idaho Granite Works offers a full range of textures and custom finishes. 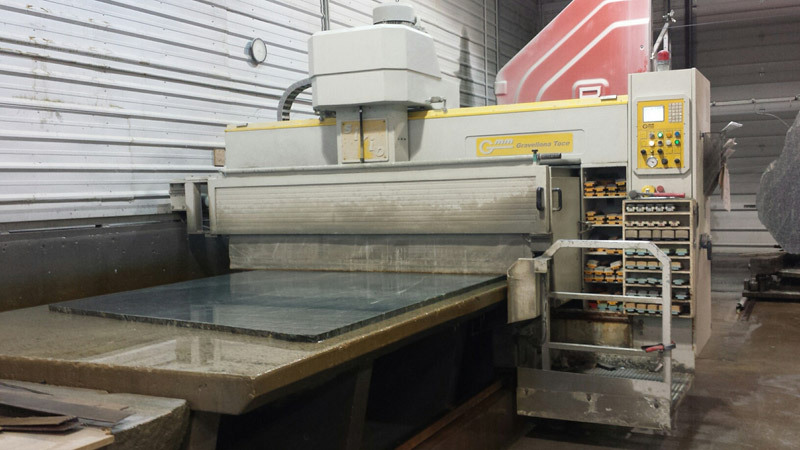 Our polishing and texturing machine for stone slabs and cubic stock has a working table area of 7 feet wide and 40 feet long, allowing us to process material efficiently and pass the savings on to you. Our shop also specializes in restoring the surface of damaged or faded slabs. If you have bundles with surface imperfections or too many fissures and cracks to retail, we can surface, resin, and polish back to new or better condition. The pricing table below is based on slabs 40 sq.ft. or larger, that are rectangular in shape. A polished surface is glossy and highly reflective. Polished granite countertops are the most popular countertop installed in kitchens today. Granite is especially receptive to this high-gloss, mirror-like surface because of its makeup. Quartz, feldspar, and mica polish up easily, hold the polish well, and reflect light. Honing produces a smooth, flat matte finish and mutes the color of the stone some. Honed granite is a non-reflective, satiny finish. Matte on natural stone surfaces creates a softer feel in your granite countertop. There are several types of rough finishes. You’ll hear terms like leathered, brushed, antiqued, caressed and bush hammered to describe these finishes. The use of these names has not been standardized within the industry. We can vary the depth of the texture and the amount of gloss. The amount of texture produced varies from stone to stone. Different levels of sheen and relief appear depending on the hardness of the minerals in the matrix of the stone. Most rough surfaces are used in outdoor applications. However, some of the finishes (leathered, brushed, antiqued) are beautiful in your kitchen or bathroom. They lend a certain patina to your design that suits both modern and classic designs. The bush hammered finish is best used for exterior applications such as walkways and steps. It is a rough or stippled surface.